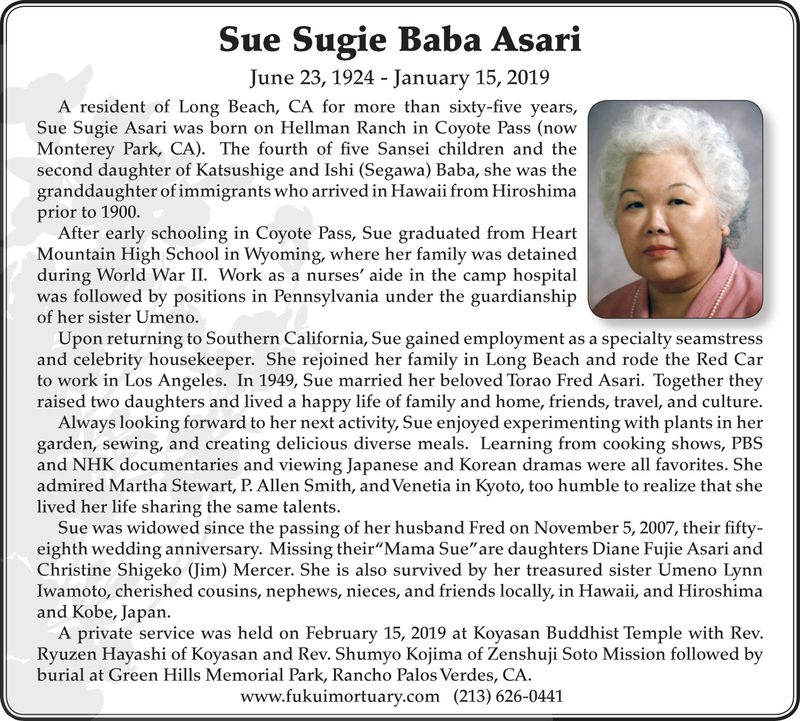 A resident of Long Beach, CA for more than sixty-five years, Sue Sugie Asari was born on Hellman Ranch in Coyote Pass (now Monterey Park, CA). The fourth of five Sansei children and the second daughter of Katsushige and Ishi (Segawa) Baba, she was the granddaughter of immigrants who arrived in Hawaii from Hiroshima prior to 1900. After early schooling in Coyote Pass, Sue graduated from Heart Mountain High School in Wyoming, where her family was detained during World War II. Work as a nurses’ aide in the camp hospital was followed by positions in Pennsylvania under the guardianship of her sister Umeno. Upon returning to Southern California, Sue gained employment as a specialty seamstress and celebrity housekeeper. She rejoined her family in Long Beach and rode the Red Car to work in Los Angeles. In 1949, Sue married her beloved Torao Fred Asari. Together they raised two daughters and lived a happy life of family and home, friends, travel, and culture. Always looking forward to her next activity, Sue enjoyed experimenting with plants in her garden, sewing, and creating delicious diverse meals. Learning from cooking shows, PBS and NHK documentaries and viewing Japanese and Korean dramas were all favorites. She admired Martha Stewart, P. Allen Smith, and Venetia in Kyoto, too humble to realize that she lived her life sharing the same talents. Sue was widowed since the passing of her husband Fred on November 5, 2007, their fifty-eighth wedding anniversary. Missing their “Mama Sue” are daughters Diane Fujie Asari and Christine Shigeko (Jim) Mercer. She is also survived by her treasured sister Umeno Lynn Iwamoto, cherished cousins, nephews, nieces, and friends locally, in Hawaii, and Hiroshima and Kobe, Japan. A private service was held on February 15, 2019 at Koyasan Buddhist Temple with Rev. Ryuzen Hayashi of Koyasan and Rev. Shumyo Kojima of Zenshuji Soto Mission followed by burial at Green Hills Memorial Park, Rancho Palos Verdes, CA.